Slow Cooker Spicy Black Beans and Tomatoes can be used in lots ways! 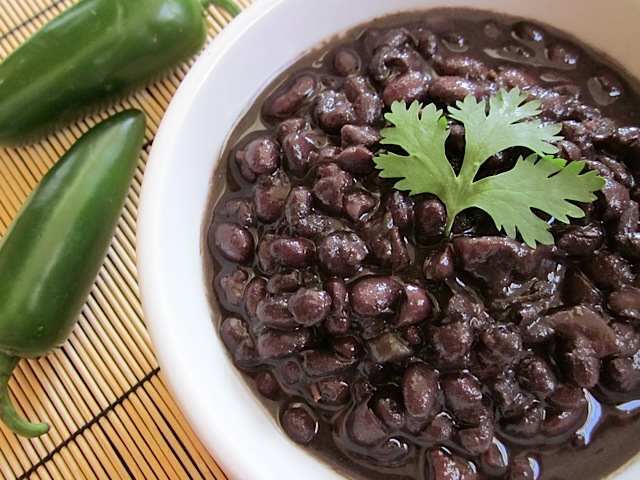 This is a great cook-on-the-weekend recipe and you’ll have black beans to use during the week! Click here to see The BEST Instant Pot Recipes with Black Beans! Beans are such a perfect starting place for so many different recipe ideas, and these Spicy Black Beans and Tomatoes from Budget Bytes could be eaten as a side, with rice, in burritos, in tacos, or mixed into a salad. This easy recipe starts with dried beans, and if you don’t use them all right away they’re perfect to freeze for future meals. Get the Complete Recipe for Spicy Black Beans and Tomatoes from Budget Bytes. Use the Recipe-by-Photo Index Page for Beans and Legumes to see all the slow cooker or pressure cooker bean recipes that have been featured on this site. This is one of those great basic recipes you can make in the slow cooker (keep the kitchen cool!) and freeze in small portions to use in many dishes. I'm intrigued by the use of tomatoes, which I had always heard would keep the beans from softening. Good to know it will still work with them. Has anyone made this yet? I have tried several time to make dried beans in the crock pot but it never works out quite right for me. Plus the addition of tomatoes makes me nervous as they tend to make the beans tough when added too early. Frugal Momma, I've cooked dried beans in the slow cooker many times with great results (even starting with unsoaked beans.) If your beans are fresh (not ones that have been in the pantry for a long time) you will have better results. I have not tried this recipe, but I do really trust this blogger.